Bingo is one of the most popular types of gambling in the world. Every country has some kind of bingo available. Electronic and online bingo haven’t reached the kind of popularity as the game on paper, but it’s growing rapidly. Electronic bingo has a lot of similarities to slot machines. In fact, in some jurisdictions, these electronic bingo games are identical to slots. This page is about more traditional bingo. Practically everyone wants to try bingo games for real cash. Royal Ace Casino is the best place to play bingo online for real money. They are an honest site with fast deposits and cashouts. They are currently offering an unlimited match bonus on your first deposit if you use the code NEWROYAL100. Casinos are often the best places at which to play. The game is often operated at a loss to the house in order to attract players to the other games there. These games are often only held intermittently, so many players use that time to play keno and/or slots. Most bingo games get started when you pay $1 (or more) to buy a card. You can buy and play as many cards as you like, but you have to be able to keep up with all of them. The “caller” for the game announces letter and number combinations, which are determined either by a computer or by a cage with labeled balls in it. The player marks the numbers on her card as they’re called. 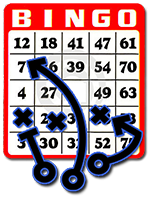 If and when the marked numbers match a specified pattern, the player gets a “bingo” and wins a jackpot. Depending on how hard it is to win with a particular pattern, the jackpot might be large or small. For example, four corners, coverall, and no numbers are all patterns which typically feature higher payouts. You should play in Nevada if you can. The odds and payouts are just much better there. The house edge on these games in casinos away from the Strip varies from between 1% and 3%. Failing that, find a good site where you can play online. You should also play with as few competitors as possible. One of the best ways to do this is to ask an employee when the slow periods are, then plan your play accordingly. Buying multiple cards is only a good idea if you can keep up with them all. You’ll have a better chance of winning if you play multiple cards, but keep in mind that the house edge remains the same regardless of how many cards you play. Payoffs vary from as little as $1000 to as much as $25,000 or more. Some casinos also offer vacation packages as part of their prize pools. Also, since bingo is a slower game than just about any other game in the casino, your expected hourly loss rate is going to be lower based on the limited amount of action you’re seeing each hour.